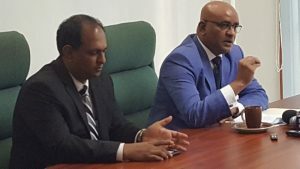 After the No-Confidence Motion (NCM), Jagdeo had hoped pressure from his cohorts in the Private Sector Commission (PSC), and at the Stabroek News would have forced the government to resign. If this had happened, Jagdeo would have nullified a significant amount of the incumbency advantage the government enjoys. In addition, he would have forced election within a period when the government was still absorbing the powerful message its supporters sent during the Local Government Elections (LGE). There would have been no time for adjustment or correction. Posted by: Denis Chabrol in Demerara Waves – March 6, 2019 President David Granger and Opposition Leader Bharrat Jagdeo hold meetings, accompanied by their delegations. 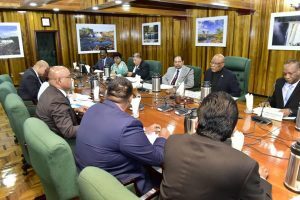 President David Granger Wednesday morning maintained that he could not call an election date unless the “independent” Guyana Elections Commission (GECOM) is ready, and he is expected to meet the seven-member body next week. “GECOM is in charge of elections, not the Executive. 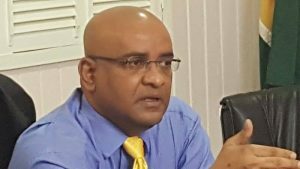 I cannot decide when elections will be held,” he said minutes after meeting Opposition Leader Bharrat Jagdeo. A scathing editorial in the Kaieteur News last Friday shockingly castigated Members of Parliament in most un-parliamentary language, from which the headline is taken. Here is another sample: “In some respects what Guyana has is not a legislative body, but a Roach Motel overflowing with a cast of creepy characters, a real life Bates Motel horror of shocks that frightens the public. It is obvious that the great majority of members have little by way of shame or nonnegotiable moral imperatives. The announcement by Government that it has signed a Memorandum of Understanding (MOU) with Fedders Lloyd, a reputable Indian company, relating to the Specialty Hospital project, has attracted several negative comments. During the life of the last government, the then Opposition consisting of both the AFC and APNU had refused to support the Specialty Hospital. The population has learnt not to expect much that is edifying in the annual budget debates. This ritual by the political classes throws up with mundane regularity all that is wrong with our political culture. It gives them the opportunity to reinforce the principles that underlie that political culture so as to fuel it up for another year.